This Ballet, Pilates and Yoga infused class uses a Barre against the wall. It is designed to use your large and small muscles to increase strength, stability and elongate your muscles. Resistance bands and weights are also used. Create long lean muscles and feel the exhilaration when you wake up the next morning and notice muscles you didn't know you had. No Barre, yoga or ballet experience is necessary to enjoy this class. 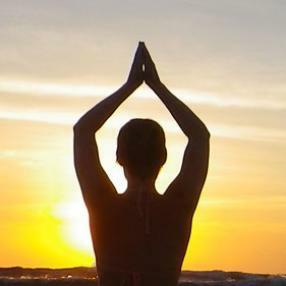 A form of yoga that focuses on being present in whatever pose you are holding, cultivating ease, connecting with the breath, and working to calm the mind. Great for stress relief, keeping body supple, yet strong. Khundilni Yoga is described as the Ancient mother of all yoga. It focuses on the Mind, Body and Spirit. Through the use of posture, breathing, relaxation and meditation. It is the Full and Complete Yoga package. If you are looking for Relaxation, Peace and Calm, this is it. We have 2 amazing and wonderful teachers Ranjit and Ajooni. Both are fully trained and certified. Between them they have almost a half century of Kundalini yoga practice, experience and knowledge. Yoga and the Luminous Body is a blending of two ancient practices, Yoga and Shamanism to heal and balance the energy body. You will work directly with your chakra system to awaken and to bring your chakras into balance. The asana practice will break down blockages within your energy body and enhance each chakra through chakra specific postures. There will also be opportunities to use drums and rattles to participate in your own personal healing. This class is suitable for All Levels & Beginners. Connecting movement and breath in a guided one hour practice set in a series of poses already familiar and encourage yourself to build up stamina and endurance within your yoga practice. Some stretching and meditation and hands on assist. Yin Mudra yoga is a practice that brings you deeper within your energetic body. You will experience Yin yoga postures and mudra hand positions to unblock the energy meridians that run throughout the body. Support your health and healing through cultivating balance and harmony through deepening your ability to recognize the messages of the body; enhancing your sensitivity to the flow of subtle energy, and releasing the limiting beliefs that nurture challenging emotions and thoughts. some have been on it off and on for awhile. your body, mind and soul. Come out and enjoy a weekly yoga class. We understand how it feels to enter a yoga class as a new practitioner or a student just getting back to yoga after an extended period of time. Yoga fundamentals teaches you the fundamentals of yoga by breaking down the poses to their basic form and applying these poses and breath techniques in a 60-75 minute flow. Perfect for when you just feel like reconnecting to a fuss-free practice. Judgment-free zone. I will use Yoga techniques to assist you in strengthening, stretching and learning how to better serve yourself. I will also use Yoga Medicine to help you if you are suffering from many different chronic we will build strength, and open up tights areas in your body. Together we will look to find out why you might be suffering and work towards a better more mobile life.